Continuing Delta�s tradition of honoring Indigenous peoples throughout the world, for 2015 Delta looks to Papua, New Guinea, where the Asaro Mudmen warriors once used their cunning to trick their enemies into believing they were spirits by covering themselves in mud and donning frightful masks. Today, to thank and honor those spirits, the Asaro Mudmen make masks with unusual designs such as large eyes featuring extended eyebrows, long or very short ears, even some with horns. The diabolically long fingernails affixed to their hands complete the picture that must have petrified their enemies so long ago. All of the Indigenous Peoples collections are the result of collaboration between Delta�s in-house production team and the creative intellect and styling of Milanese sculptor and designer Francesco Rienzi. Delta and Rienzi offer a perfect journey traveling around the world to rediscover all the indigenous peoples that are to some extent forgotten, but still firmly tied to their history, culture, tradition and religion. The Papuasi Limited Edition collection is available in four stunning versions with each pen turned by hand from Italian resin, individually numbered and luxuriously gift boxed. Only 975 of the three standard models and 34 of the Celebration fountain pens will be produced. The fountain pens are enhanced with an 18k Fusion nib, in either button fill or cartridge/converter fill (converter included). In 1992, Delta, through collaboration with Momo Design, was the first manufacturer to utilize titanium and carbon fiber in the production of writing instruments. In 2012, Momo design celebrated its 30th Anniversary and the two companies once again joined forces in the creation of a groundbreaking collection of writing instruments. The original Momo 30th Anniversary Limited Edition is sold out. All pens feature genuine carbon fiber and are accented with black rhodium trim. Fountain pen features Delta�s flawless internal piston filling mechanism and is now fitted with an 18kt gold nib and only 50 pieces worldwide. With the launch of the Limited Edition Vatican Museum Pen Collection, Delta pays homage to the innovative 19th century architect and engineer Giuseppe Momo. Born in Vercelli in 1875, Giuseppe Momo is famous for his work featured in many important religious buildings throughout Italy, especially in Turin and Piedmont. In 1932 Pope Pius XI commissioned Momo to transform the Vatican by designing a new entry allowing access for visitors to the exhibition grounds of the Vatican Museum. His design was highlighted by the incredible Double Helical Staircase which took over two years to complete. The Vatican Museum features several impressive galleries of artwork and artifacts collected by popes over many centuries. Displays include the Raphael rooms and the famous painted ceiling of the Sistine Chapel, as well as other masterpieces. Made up of two wrought iron intertwined spirals; one leading upwards, one downwards shaped like a double helix, the staircase itself serves as an impressive work of art in its own right. Delta, using traditional jewelry techniques, the vibrant orange resin cap is encased in a deep relief overlay in solid bronze, which reflects both the shape of, as well as design features, from the Momo staircase. The cap top is finished to reflect the design of the skylight located at the top of the Momo Staircase. The barrel is fashioned of a highly polished jet black resin, set off by a band of matching bright orange marble resin and sterling silver. Each version of the pen is limited to 1932 pieces worldwide. The lK Fountain Pen Limited Edition cap is crafted from bronze and plated with precious rhodium. The fountain pen has the innovative Fusion 18kt gold nib (steel and 18 carat gold). The filling system is by cartridge or the included converter. The cap of the R Rollerball Limited Edition cap is crafted from bronze and plated with precious rhodium. Delta pays homage to the innovative 19th-century architect and engineer Giuseppe Momo, famous for his work featured in many important religious buildings throughout Italy, especially in Turin and Piedmont. In 1932 Pope Pius XI commissioned Momo to transform the Vatican by designing a new entry allowing access for visitors to the exhibition grounds of the Vatican Museum. His design was highlighted by the incredible Double Helical Staircase, which took over two years to complete. The Momo Double Helical staircase is one of the most photographed pieces in a museum that features 9 miles of art. Made up of two wrought iron intertwined spirals; one leading upwards, one downwards shaped like a double helix, the staircase itself serves as an impressive work of art in its own right. Crafted by hand, each cap of the Delta Vatican Museum Collection features a stylized reproduction of Momo�s greatest work of art, the Double Helical staircase. Using traditional jewelry techniques, the vibrant orange resin cap is encased in a deep relief overlay, which reflects both the shape of, as well as design features from the Momo staircase. The cap top is finished to reflect the design of the skylight located at the top of the Momo Staircase. The barrel is fashioned of a highly polished jet-black resin, set off by a band of matching bright orange marble resin and sterling silver. The Bribri people of Costa Rica are honored in the latest edition of Delta*s celebrated Indigenous Peoples collection of limited writing instruments. The Bribri are an American Aboriginal people living in the forests and Caribbean coastal areas of Costa Rica. Given their right to live on their lands in 1977, the Bribri today are full members of modern society while retaining their native language and customs. The caps and barrels are turned by hand from solid bars of special resin. The end of the cap is adorned with a cabochon that, in relief, portrays an ancient breastplate medallion of pre-Colombian goldsmith art. The clip depicts a frog standing in a tree branch (in the geographic area where the Bribri people are located there are more than 100 different species of frogs), while the central ring reproduces a Bribri tribal mask. These detailed parts are obtained from a traditional metal fusion lost wax technique synonymous with pure craftsmanship, which are polished by hand and finished with plating in either precious rhodium or solid gold (depending on the version). Limited to 977 pieces of each mode, the collection consists of a piston-filled fountain pen, available in either gold or rhodium trim; a cartridge/converter filled fountain pen (converter is included); a capped rollerball and a twist-action ball pen (all with precious rhodium trim). All fountain pens in the collection are fitted with the Delta�s revolutionary Fusion nib encompassing the fusing of a combination of various metals such as 18 carat solid gold and steel alloy, resulting in a more functional fountain pen. The Kanaka Maoli, warriors and fishermen, aborigine of the Hawaiian islands where the rhythm of life is in perfect harmony with the body and the mind, where all is connected to nature by means of respecting the mother Earth, the father Ocean, and the rest of humanity. Their language, which today does not have any official acknowledgment, resembles in some way that of the Tahitians or the Maori from New Zealand. The Kanaka Maoli collection includes a special version (1KS) limited to 898 fountain pens featuring the lateral lever system and the characterizing elements in special bronze alloy plated with 24 carat gold. The collection comprises also the (1K) version limited to 1898 fountain pens with the cartridge/converter filling system and with the characterizing elements in special bronze alloy Rhodium plated. The fountain pen of each version is enhanced with an 18 kt gold nib. Also available are 1898 ballpoint pens with twist mechanism and the same characteristics as the 1K version. The body and cap are turned by hand from solid bars of a new and special resin created to include the most widespread colors in this splendid archipelago. In the top of the cap an engraved medal is offered portraying the famous icon of these marvelous islands, the turtle. Also placed in the cap a ring portraying the well known Hawaiian flower lei and a clip depicting an old Kanaka warrior*s mask. The extremity of the pen body is in metal and is shaped as the Hawaiian Tribal drums. All these characterizing elements are created using the traditional handcraft technique known as the *lost wax* casting process. The Kanaka Maoli, warriors and fishermen, aborigine of the Hawaiian islands where the rhythm of life is in perfect harmony with the body and the mind, where all is connected to nature by means of respecting the mother Earth, the father Ocean, and the rest of humanity. Their language, which today does not have any official acknowledgment, resembles in some way that of the Tahitians or the Maori from New Zealand. The Kanaka Maoli collection includes a special version (1KS) limited to 898 fountain pens featuring the lateral lever system and the characterizing elements in special bronze alloy plated with 24 carat gold. The collection comprises also the (1K) version limited to 1898 fountain pens with the cartridge/converter filling system and with the characterizing elements in a special bronze alloy, rhodium plated. The fountain pen of each version is enhanced with an 18 kt gold nib. Also available are 1898 ballpoint pens with twist mechanism and the same characteristics as the 1K version. The body and cap are turned by hand from solid bars of a new and special resin created to include the most widespread colors in this splendid archipelago. In the top of the cap an engraved medal is offered portraying the famous icon of these marvelous islands, the turtle. Also placed in the cap a ring portraying the well known Hawaiian flower lei and a clip depicting an old Kanaka warrior*s mask. The extremity of the pen body is in metal and is shaped as the Hawaiian Tribal drums. All these characterizing elements are created using the traditional handcraft technique known as the *lost wax* casting process. Delta proudly introduces the eighth collection in the Indigenous People series. The Maya civilization began around 1500 B.C., though some archaeologists speculate that the civilization had its beginnings earlier since artifacts like pottery have been found from around 2000 B.C. The Maya civilization extended throughout the southern Mexican states and into the northern Central America area comprising parts of present-day Guatamala, Belize, El Salvador and Honduras. The Mayan civilization is regarded as among the most sophisticated of classical cultures. The ancient Mayans are known for having built magnificent cities with sophisticated art and architecture. They are also known to have been quite advanced in astronomy, arithmetic, and language. The Maya writing system is made up of 800 pictographic and syllabic glyphs. Mayan hieroglyphic writing is a constant source of wonder to scholars, as is the advanced calendar system that they developed to keep track of days and predict the future. The Maya calculation of the length of the solar year was somewhat superior to the Gregorian calendar. According to the Maya, the world will end on December 21, 2012 AD. There are 28 Mayan languages still spoken by about 6 million people in Central America and Mexico. Each pen is hand-turned from a solid bar of specially designed blue and red resin representing the colors commonly used by the Maya warrior for body paint and in their garb. The pen�s central ring�s d�cor was used in Mayan pottery. The clip represents a typical Mayan double clay flute. The Limited Edition comprises 800 fountain pens and twist-action ball pens, with the clip and central ring in .925 sterling silver and the fountain pen�s filling system by converter or cartridge. The ball pen features a twist mechanism and easily converts into a rollerball with a simple refill change. The Maya collection includes 800 Special Edition fountain pens with vermeil (gold-plating over sterling silver) clip and central ring, with Delta�s push button filling system. Both fountain pens are enhanced with 18 kt. solid gold nibs available in Medium, Fine, Extra Fine and Broad widths. Sporty design and at the same time elegant, the Titanio Limited Edition is produced from a special titan grey resin turned by hand from solid bars. Only 100 fountain pens and 100 ball pens are available worldwide. The trimmings are carved from solid titanium ingots using special tooling due to Titanium�s hardness. The same applies to the innovative nib, which is also in titanium, requiring innovative technology to be produced. The result is a nib offering flexibility similar to that of a solid gold nib. The nib is available in fine and medium widths. The clip features a special mechanism to facilitate placing in the pocket, in a special metal alloy, rhodium plated. The collection is completed with a matching ball pen with a twist mechanism. The fountain pen filling system is either by converter or cartridge. Sporty design and at the same time elegant, the Titanio Limited Edition is produced from a special titan grey resin turned by hand from solid bars. Only 100 fountain pens and 100 twist-action ball pens are available worldwide. The trimmings are carved from solid titanium ingots using special tooling due to Titanium�s hardness. The clip features a special mechanism to facilitate placing in the pocket, in a special metal alloy, rhodium plated. The fountain pen filling system is either by converter or cartridge. The Mapuche people were the first inhabitants of half of the area today known as Chile and Argentina. Before the Spanish arrived in 1541, the Mapuche occupied a vast territory in the Southern Cone of the continent. The Mapuche nation now constitutes the third largest indigenous society in South America. A century after their arrival, the Spanish signed the Treaty of Quillin (1641) which defined frontiers with the Mapuche nation. With the defeat of the Spanish by the newly formed states of Argentina and Chile in 1810, the original treaties of 1641 were abrogated. Under the pretext of promoting civilization and Christianity, the Mapuche people suffered territorial conquest, military aggression and persecution resulting in the destruction of entire communities. Today, the new democratic government in Chile has provided financial support for Mapuche groups. The call now is for judicious funding of projects that the Mapuche themselves plan. The Mapuche persist in demanding respect for their rights as a people, the return of their lands, and justice and freedom. The collection is hand turned from solid bars of a specially designed dark grey resin interleaved with jagged layers of white resin, portraying rock formation commonly found in the region. 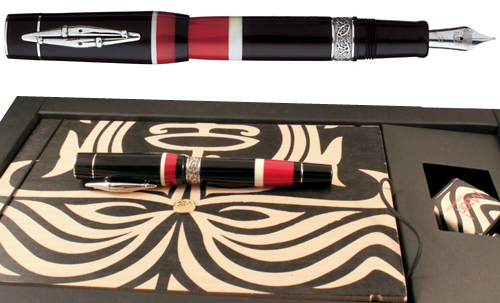 The pens feature a solid sterling silver ring decorated with drawings from the Mapuche flag. A medal on the cap is engraved with a picture of the Mapuche calendar portrayed in the flag as well as rings in resin in same colors as the flag. The sterling clip features a three-dimensional representation of the typical tribal totem, called Chemamull. The collection is comprised of 541 numbered Special Edition fountain pens in vermeil trim (gold-plating over sterling silver) with a push button filling system. The Limited Edition comprises both 1,541 numbered fountain pens, cartridge/converter filling, and 1,541 ball pens with sterling silver trim. Each fountain pen is enhanced with an 18 kt gold nib, available in M, F, XF and B widths. The ball pens are easily convertible into rollerballs. AMERIGO VESPUCCI -Limited Edition...Delta presents Amerigo Vespucci, a collection limited to 931 writing instruments in each finish, dedicated to the famous navigator and the Italian military Navy ship honoring him, and transformed into a school-vessel for the training of future navy officials. A detail of a cleats cover shapes the top of the cap. The ropes wrap the cylinder, and on the body the words �Amerigo Vespucci� are engraved using the same font used in the ship�s label. The central ring is similarly engraved. The clip is shaped as the boatswain weasel; every hiss, every note, every pause, onboard, has a distinct meaning. The precious wood, used for the making of every cap, merges seamlessly with the special resin of the body. Made from special hand-turned resins and the authentic wood from the famous school ship, worked by hand using old crafting techniques and finished by hand using bee and carnauba waxes for the final polishing. The trimmings are in solid sterling silver with an aged finished. The fountain pens are enhanced with an 18kt gold nib, available in M, F, XF, B and Stub. The Ocean Blue fountain pen offers a push button filling system and the Night Black version is cartridge/converter fill. The rollerballs are easily convertible into ball pens. AMERIGO VESPUCCI -Limited Edition...Delta presents Amerigo Vespucci, a collection limited to 931 writing instruments in each finish, dedicated to the famous navigator and the Italian military Navy ship honoring him, and transformed into a school-vessel for the training of future navy officials. A detail of a cleats cover shapes the top of the cap. The ropes wrap the cylinder, and on the body the words �Amerigo Vespucci� are engraved using the same font used in the ship�s label. The central ring is similarly engraved. The clip is shaped as the boatswain weasel; every hiss, every note, every pause, onboard, has a distinct meaning. The precious wood, used for the making of every cap, merges seamlessly with the special resin of the body. Made from special hand-turned resins and the authentic wood from the famous school ship, worked by hand using old crafting techniques and finished by hand using bee and carnauba waxes for the final polishing. The trimmings are in solid sterling silver with an aged finished. The fountain pens are enhanced with an 18kt gold nib, available in M, F, XF, B and Stub. The Ocean Blue fountain pen offers a push button filling system and the Night Black version is cartridge/converter fill. Delta�s Evolution celebrates the 200th anniversary of the birth of Charles Darwin (1809�1882) and his remarkable theory of natural selection. Over its history, Delta has become known as the pen of great events and great persons, characterized by handcrafted quality and traditional techniques, and Evolution is a natural creation of this tradition. These limited edition pens are hand-turned from solid blocks of marbled blue resin. The bands and rings are .925 solid sterling silver, engraved with high accuracy using jeweler expertise to achieve a tri-dimensional effect, offered in aged silver finish. The central ring depicts the famous sketch �Darwin�s Finches� in high relief. Each mode is limited to 809 pieces. The fountain pen is enhanced with Delta�s 18kt gold nib in M, F, EF and B, cartridge/converter fill. This fantastic limited edition fountain pen is worth acquiring: the Delta Demonstrator is produced from clear resin which allows you to see the patented Delta ink reservoir and piston-filling system at work.Demonstrator pens have always been sought-after by pen lovers around the world. Only 100 pens worldwide. ONLY 20 PENS USA. Diego Velasquez, the 17th century Spanish painter who was the official painter for the royal court, is considered to have been the principal exponent of the Baroque style of painting. �Las Meninas�, a painting from 1656, presently housed in the world-famous Prado Museum in Madrid, is perhaps his most recognized masterpiece, showing the infanta Margarita surrounded by her maids of honor. In tribute to the genius of Velasquez, Delta proudly presents its first button-filling fountain pen, in a transparent demonstrator, limited edition of 656 fountain pens. The button-filler/bottle-fill only system has a historic place in the evolution of fountain pens, taking its place alongside the lever filler in the 1910�s. The Infanta portrait affixed to the barrel is carved from solid sterling silver. The 18 kt gold nib, with platinum overlay, is available in M, F, XF and B. The Indigenous People of India. During the first decades of the 20th Century, educated and politically active tribes from eastern central India started to use the Hindi/Sanskrit term �Adivasi� meaning �original inhabitant�, corresponding to the modern concept of �indigenous peoples�. Honoring these noble peoples, the three-dimensional clip of this majestic collection is a representation of a typical tribal sculpture of the Sarangi and the metal bands on the cap and barrel represent typical prints used in Adivasi garments. Each pen is trimmed in sterling silver and hand-turned from solid bars of special mother of pearl resin. The fountain pens are enhanced with Delta�s 18 kt gold nib in M, F, EF and B. In 1948, the nation of Israel declared independence and in 2008 Israel celebrates its 60th anniversary. In this land, older than the Bible itself, where history was first recorded with the written word, there is a celebration of rebirth about to take place. It is but once in a country's history that there is an observance in commemoration of its 60th anniversary. There is but one country that was founded as the homeland for one people who share a sole common bond �.Israel. On May 14, 1948, the nation of Israel was proclaimed. Delta has now created the Israel 60 collection to celebrate this important milestone�. Israel's 60th Anniversary. The collection is hand turned from solid bars of blue and black resin. All pens feature in the top of the cap a medal featuring the Samech, the letter of the Hebrew alphabet which represents the number 60.The clip is made of solid sterling silver (.925) and reproduces the �yad� (literally, a hand), which is a Jewish ritual pointer, used to point to the text during the torah reading. It is intended to prevent anyone from touching the parchment, which is considered sacred. The central ring, also sterling silver, is engraved with the Menorah, the official symbol of the state of Israel. The menorah is a seven-branched candelabrum lit by olive oil in the Temple of Jerusalem together with two branches of the olive tree, a symbol of peace and friendship between peoples. The Israel 60 collection offers 1948 each of the capless rollerball and Limited Edition fountain pens, and 948 Special Limited Edition fountain pens (in vermeil trim) with lateral lever filler. The Limited Edition features a threaded converter or ink cartridge filling system and the rollerballs are easily convertible into ball pens. The 18 karat solid gold nib is specially designed and customized with the Star of David, and is available in M, F, EF and B widths. The Sami people, more commonly known as the Lapp, inhabit the northernmost section of the Scandinavian Peninsula and are the only native population in Europe�tracing their roots to the Ice Age, over 9500 years ago. To be Lapp meant to be a person that practiced the breeding of reindeer, fished and hunted. Today, the pastures are considered the more important resource on which the traditional culture stands. Though not an independent state, today�s Sami have their own representative parliament body, own capital and flag and their population is estimated at 75,000, of which 20,000 live in Sweden. The Special Limited Edition honoring the Sami is trimmed in vermeil with a lateral filling system. The Limited Edition, in sterling silver trim, features a threaded converter or ink cartridge filling system and the rollerballs, in sterling trim, are easily convertible into ball pens. Each fountain pen is enhanced with an 18 karat solid gold nib and is available in M, F, EF and B widths. Born in 1807, Giuseppe Garibaldi is considered the foremost military figure and popular hero of the age of Italian unification known as the Risorgimento. With Cavour and Mazzini, he is deemed one of the makers of Modern Italy. Cavour is considered the brain of unification, Mazzini the soul, and Garibaldi the sword. For his battles on behalf of freedom in Latin America, Italy, and later France, he has been dubbed the Hero of Two Worlds , and was also known as a military advisor to Abraham Lincoln. In honoring this remarkable hero, Delta dedicates this stunning collection to the ideals of freedom of expression, solidarity and peace. The Garibaldi collection offers 1807 each of the capless rollerball and Limited Edition fountain pens depicting Garibaldi�s classic battles, and 807 Special piston-fill Limited Edition fountain pens (in vermeil trim), hand painted using museum quality techniques employed in the 1800�s. The Limited Edition features a threaded converter or ink cartridge filling system and the rollerballs are easily convertible into ball pens. Each fountain pen is enhanced with an 18 karat solid gold nib and is available in M, F, EF and B widths. Giacomo Puccini was born in Lucca, Italy, in 1858, into a family with a long history of music. At age 14 he was a church organist and choirmaster, but it was not until he saw a performance of Verdi's �Aida� that he became inspired to be an opera composer. In 1882 he wrote a one-act opera, �Le Villi� that caught the attention of Giulio Ricordi, who commissioned a second opera, �Edgar� (1889). �Manon Lescaut� (1893), his third opera, was a great success. It launched his remarkable relationship with the librettists Luigi Illica and Giuseppe Giacosa, who collaborated with him on his next three operas: �La Boh�me� (1896), �Tosca� (1900), and �Madame Butterfly� (1904). Composition was slow after this. He died on November 29, 1924. Another composer finished �Turandot�, his last opera, but when it was performed the orchestra stopped, the performers froze in position and the conductor turned to the audience and said: Here the opera finishes, because at this point the Maestro died . Hand-turned from a solid bar of special ruby resin, the Puccini collection is trimmed in solid sterling silver: 858 fountain pens are offered with lateral lever filling system, 1858 fountain pens are cartridge/converter fill, and 1858 rollerballs with cap, which are easily convertible into ball pens by a simple refill change. In the top of the cap is a medal in sterling silver featuring Puccini�s bust. And the center ring features music notes engraved and filled with red enamel. The cap of the lateral filling model is covered by a solid sterling silver sleeve engraved with a design of various sized circles portraying sound waves, and a design of music notes highlighted with red enamel. The 18 kt solid gold nib also portrays sound waves and is available in M, F, XF and B. A collection of writing instruments offered in limited number dedicated to the �Ilaria Alpi Journalistic Television Award 2006� established in 1995 in Italy under sponsorship of the Italian UNESCO Commission and the President of the Republic. The Prize is dedicated to Ilaria Alpi, the Italian journalist killed in Mogadishu in 1994, together with the cameraman Miran Hrovatin. It is a Prize honoring, among other things, the highest standards of well researched, clear and truthful journalism. Solidarity, non-violence, justice, and human rights are some of the social themes competing for the Award. Declaring that ethics is not only a label, Delta believes in the advantages of information that is alive, real and accurate. Since the beginning of its history, Delta has respected the highest standards of quality, which have characterized its production, releasing writing instruments of unquestionable excellence. The scrupulous choice of materials and the attention dedicated to every phase of production, allows Delta to perpetuate ancient handicraft techniques by following the best traditions of old-world Italian artisans. The fountain pens are enhanced with an 18kt gold nib, available in M,F,XF and B.
Delta dedicates their eighth Indigenous People Collection to the remarkable natives of the Amazon rainforests of Brazil. The Irmaos no Mundo (Brothers of the World) have lived in the Brazilian rainforests for thousands of years. In the year 1500, Portuguese explorers discovered these semi-nomadic peoples. They were called �Indios� (Portuguese for �Indians�). Five centuries ago, an estimated 2000 tribes had a combined population numbering in the millions. Although their numbers have dwindled, their beauty and respect for the natural wood remains one of our planet�s most celebrated aboriginal cultures. The collection includes a Special Limited Edition of 1,500 pens with a lateral lever filling system, in vermeil trim (gold-plating over sterling silver), that is hand turned from solid bars of a special brown Hevea color and black resin. The Limited Edition with sterling silver trim is limited to 1,500 pens and is cartridge converter fill. A matching Limited Edition rollerball of only 1,500 pens completes the collection. The fountain pens are enhanced with an 18kt gold nib, available in M, F, XF and B. King Charles Bourbon III�s Palace at Caserta is the epitome of Italian baroque styling and is widely considered the most opulent palace ever built, even eclipsing Versailles. The Royal Palace is symbolic of the Age of Enlightenment. More than a royal home, the palace was a seat of power where government was run and the highest degree of grand lifestyle and the country�s unique customs were defined. Dedicated to this grand monument is this spectacular new collection made of aged celluloid, replicating the splendor of aristocratic reddish-brown marble columns. The pens are trimmed in sterling silver featuring architectural and philosophical palatial details. The hand-crafted fountain pen is enhanced with an 18 kt. gold nib available in medium, fine, extra-fine and broad widths, filling by Delta�s lateral lever. An exquisite desk stand accompanies the fountain pen. The convertible, twist-action rollerball accepts ball pen, gel and rollerball refills. A beautiful 0.9mm pencil completes the collection. Only 750 of each writing mode is available. Delta�s continuing commitment to celebrate the world�s most enduring and unchanged cultures is realized in AINU, dedicated to the people of Japan�s northernmost island, Hokkaido. First �discovered� in 1643 by the Dutch sailor Maerten Vries, the Ainu produced artistic tributes to Nature and Mankind that are highly treasured by museums and collectors. The men let their hair and beards grow to unusually long lengths and the women tattooed their lips and forearms to prevent evil spirits from entering their bodies. Today�s Ainu inhabit parts of Hokkaido, Sakhalin, and the Kuril Islands. The variegated blue resin is accented with colored resin rings. The clip features a three-dimensional �Nipopo� (wooden baby) and the fountain pen nib is engraved with a �Tamasay� (a ceremonial glass bead necklace passed from generation to generation by Ainu women). The collection includes a limited edition of 1643 fountain pens in vermeil (lateral lever fill) and also 1643 fountain pens in .925 sterling silver, cartridge/converter fill. The fountain pens are enhanced with an 18kt gold nib, available in M, F, XF and B. A convertible ball/gel pen is available in sterling silver trim with only 1643 pens worldwide. Delta�s continuing commitment to celebrate the world�s most enduring and unchanged cultures is realized in AINU, dedicated to the people of Japan�s northernmost island, Hokkaido. First �discovered� in 1643 by the Dutch sailor Maerten Vries, the Ainu produced artistic tributes to Nature and Mankind that are highly treasured by museums and collectors. The men let their hair and beards grow to unusually long lengths and the women tattooed their lips and forearms to prevent evil spirits from entering their bodies. Today�s Ainu inhabit parts of Hokkaido, Sakhalin, and the Kuril Islands. The variegated blue resin is accented with colored resin rings. The clip features a three-dimensional �Nipopo� (wooden baby) and the fountain pen nib is engraved with a �Tamasay� (a ceremonial glass bead necklace passed from generation to generation by Ainu women). The collection includes A convertible ball/gel pen is available in sterling silver trim with only 1643 pens worldwide. Honoring one of the giants of film-making, the film features scenes from several movies and is lever fill.